Fashion is not limited when a woman falls pregnant. 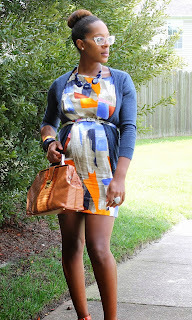 Being pregnant is not an excuse to look frumpy and out of shape because your body has taken a new shape. It is not also a call to clear your wardrobe for preggy wear or big size clothes because you are only pregnant for 9 months and will most likely go back to your normal weight after baby has come into the physical world. For me being pregnant had been a challenge for me baecause I have become a weight and size I have never been before. From 48kg to 65kg and size 30 to a size 34 in just 6months. I look at my jeans and tight drresses now and they look like they belong to my 10 years old niece. Well my advantage is that I my bump only started showing in Spring as I am expecting a summer baby so I can get away with summer dresses like Maxi dresses, empire waist dresses and leggings. Being pregnant is also not an excuse to wear extra small tops that show your belly button and tight fitting shorts or pants. Dress to be comfortable. Put your high heels on a break if you are a heel funutic like me and swap them for pumps or low rise wedges. Here a 10 other garments to have for pregnancy and post baby. You can never go wrong with a good pair (or four) of dark, stretchy leggings. Comfortable on your most bloated days, they can also give a streamlined look when tucked into boots. While there are special "maternity" leggings on the market, many moms say there's really no need. You can size up regular leggings for a bit more give, and you'll be able to get more use out of them for those post-baby days when your pooch may still be in effect. When your bump is big, just slouch the waistband below for more comfort. It's hard to say enough fabulous things about these oversize tops that hit below the hip. (Many stop at mid-thigh, but it depends on your height.) They hide and flatter a multitude of body issues and bumps, but often have lovely, slimming details like bracelet-length sleeves, vented sides, and deep V-necklines. 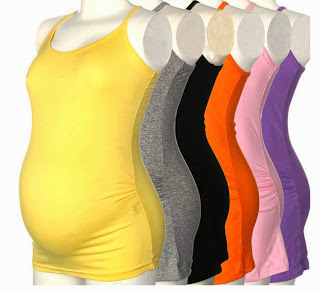 Before pregnancy, you may be able to wear one as a dress; as you go through your pregnancy, pair it with leggings or wear it over skinny jeans. After baby, you'll appreciate the extra room – plus, the added fabric can provide a discreet cover while nursing. They have become oh so trendy with women of all ages – and with good reasons. To start: Empire waists, flowing skirts, a focus on your collarbone, shoulders, and décolletage! Choose a soft jersey fabric that can drape easily over your changing body. This is another item you probably don't need to buy in the maternity department, say experts. So long as you find one in a forgiving fabric, these supersize dresses will take you through every stage. You can never have enough of these staples, but when seeking a tank with staying power and the ability to make the most of your figure, do consider investing in the best one you can find. Look for stretchy microfiber blends, ruching on the sides, and thick straps that can hide a bra (regular or nursing) and accommodate the ebb and flow of your chest. Subtle ruching will give you shape during the first trimester, then whittle your middle after delivery. Wear under everything or alone. The longer length will accommodate a belly and give some coverage to your rear – especially helpful if you're pairing the tank with leggings or skinny jeans. While the classic cardigan will never go out of style, a more unstructured option gives you more flexibility when you're expecting. No buttons to fuss with or strain against, no tissue-thin material revealing more ripples than you'd like. Instead, an unstructured cardigan – perhaps one with an asymmetrical front and a simple one-button or toggle closure near the neckline – allows you to wear it open or loosely closed. You're left with a slouchy, casual elegance that can work season after season. A thicker knit can do double duty as a light coat in fall or spring. A classic shift dress with a slight A-line (meaning body skimming around the upper body and then flared out just a smidge at the bottom) has a youthful, deconstructed silhouette that's flattering on nearly everyone, and especially so for new or expectant moms. When you're not pregnant, a shift will lightly skim your curves but have plenty of sass and swing. As you grow, there's still space for your belly to burgeon and your legs to take center stage. A dress with a scoop neck or even spaghetti straps is a particularly great option. Once you've had the baby, you'll be able to shimmy back into a shift right away! Sure, they aren't necessarily items of clothing, per se, but experts are united in their love for this most versatile accessory to amp up a variety of looks, add flair to an otherwise monochromatic outfit, or simply stretch a wardrobe you may be quickly growing tired of! It's accessories like silky, patterned scarves – as well as long, chunky necklaces or statement earrings or whatever you love – that help you make each outfit extraordinary. Plus, draping a long necklace over a slightly billowy blouse or tunic before you're pregnant helps rein in the fabric for a leaner look. Another scarf bonus: Once the baby comes, a scarf can morph into an impromptu nursing cover, a blanket for a quick rest in the park, or a makeshift shade for your stroller. When baby is not yet on board, a classic wrap dress is elegant and easy. Once your body starts to change, readjust the fit by securing the dress's ties a bit higher (right under your bust) to play up the smallest part of your slowly disappearing waistline. Look for jersey and other stretchy, blended fabrics that will grow with you but snap right back into shape. If dresses aren't your thing, wrap-style tops are a great choice for any stage. A pair of black boot-cut yoga pants will be another workhorse of your wardrobe. Wear them from the gym to the store, to a casual lunch with friends, or even to see a midday movie. Find a pair with a wide fold-over waistband, which allows you to either fold it down beneath your belly or extend it up over the bump, when the extra cradling of your belly might feel nice. If you have a c-section, you'll probably live in these pants after delivery, since they won't irritate the incision while it's healing. First things first: The term "skinny jeans" has little to do with how, um, skinny you actually are. Rather, it has become a shorthand that manufacturers use to describe a range of jeans that have one major thing in common – a slim, curve- hugging fit that gives a smooth, elongated look. Go for a dark denim, which is universally flattering, and you can dress it up or down with flats, heels, or knee-high boots. Look for a pair with at least 2 percent Lycra or other stretchy material so it can withstand the growth spurt ahead, as well as spring back once you're in the "fourth trimester" and beyond. A well-sized pair can last you well into your second (and for some women, third) trimester, if you push the waistband beneath your bump, leave the top button undone, and top it with a long stretchy tank.